May 13, 2010 - Spirit pilots, represented by the Air Line Pilots Association, Int’l (ALPA), announced Wednesday that they have received confirmation of the 30-day cooling-off period from the National Mediation Board (NMB). The NMB has given the two sides until 12:01 a.m., Eastern time, Saturday, June 12, to reach an agreement on a new pilot contract. After that time, pilot leaders may call a lawful strike. To mark this announcement, today (Thursday) pilots will conduct informational picketing outside Spirit company headquarters. The event will be from 11:00 a.m. to 1:00 p.m. at 2800 Executive Way, Miramar, Florida. Spirit pilots have been in negotiations with their management for more than three years, much of that time with the help of a mediator. In February 2010, after more fruitless sessions with management, the pilots applied to the NMB for a proffer of arbitration. 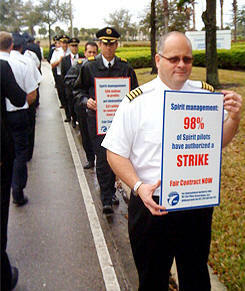 On May 3, the NMB proffered binding arbitration to both sides, which the pilots refused two days later. This refusal allowed the NMB to call for a 30-day cooling-off period, which begins today and ends at 12:01 a.m., June 12, Eastern time. Founded in 1931, ALPA is the world’s largest pilot union, representing nearly 53,000 pilots at 38 airlines in the United States and Canada. Spirit Airlines issued the following comments on Wednesday following the National Mediation Board’s formal release of Spirit and the Air Line Pilots Association, International (ALPA), the labor union that represents the airline’s pilots, from mediated negotiations. Under the Railway Labor Act, this moves the negotiations into a 30-day cooling off period. “Spirit is committed to working with ALPA and intends to reach an agreement that effectively ensures the long-term stability and growth of the company, as well as providing for rewarding and stable careers for our pilots and co-workers who do a great job for the company. “Spirit trusts that ALPA shares in the company’s strong commitment to use this period to work diligently to reach a solution that is mutually beneficial for all parties. Spirit intends to operate normally through this process. “To the extent required by any applicable federal and state law, such as the Worker Adjustment and Retraining Notification Act (WARN), Spirit will be providing notice to some employees of possible reductions that could be implemented”.